The bootstrap phase of a small & medium to a big project is usually very fast and most of the time people concentrate on developing customer-facing functionalities without really taking the back office interface into consideration. This is because everyone wants to have the system up and running as soon as they can, with the nicest UX & UI design possible for their product. But unfortunately (and often), it unavoidably leads to bad and un-intuitive internal tools for Business teams. Thousands. It is approximately the number of admin interfaces we analyzed before even starting to write any lines of code. During those interviews, we discovered some nice admin interfaces. Some others weren’t. Few of them were well thought. Many were totally incomplete which leads to complex processes, most of the time. Even CRUD, which is the baseline of essentials operations, was never exploited to its full potential. The acronym CRUD stands for Create, Read, Update and Delete which are the four major functions implemented in database and applications. They are the user and administrator interfaces, as they permit them to create, view, modify and alter data. From a historical point of view, the first reference to this acronym was made by Haim Kilov in 1990 in an article entitled “From semantic to object-oriented data modeling”. However, the term was first made popular by James Martin’s 1983 book, “Managing the Data-base Environment”. For instance, a simple burgers database table adds (creates) new burger recipe details (bread type, ingredients, vegan or not, …), accesses (reads) existing recipes details, modifies (updates) existing burgers data such as price or food allergies, and deletes recipes details when not relevant anymore. These are just basic interactions made possible by CRUD functions implementation which covers way more potentialities, when fully exploited. Indeed, when the list of burgers gets longer (’cause we all have different tastes and love different burgers), and associated data increase, it could take a longer time to access information. The solution is to implement a pagination system or an infinite scroll to better display all the burgers on the database. Burgers data, especially in a fast food restaurant chains (list of burgers, orders, customers, prices…) has to be properly sorted and relationships between them well though. It is the only way to better & faster browse & access them. 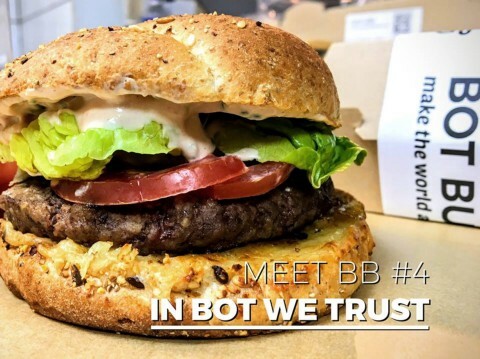 To continue in the burger analogy, let’s talk about Bot Burger 🍔, one of our clients. Orders are made via a Facebook Messenger bot and burgers are delivered fast to your door on Friday & Saturday night from 10 pm till 6 am (beta test in Paris at the moment). Let’s imagine one of their customer ordered by mistake 5 burgers while he just wanted 4 and totally forgot to add extra bacon in one of them. 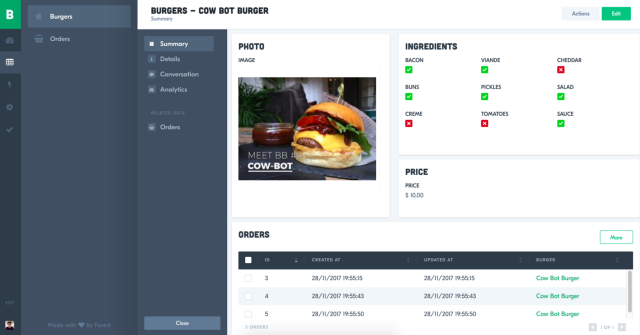 Thanks to Forest, Bot Burger Operations manager can easily access the command, make sure it’s the right one, delete the unwanted burger and add the missing bacon in the one concerned. In a few clicks, the command (its data in Bot Burger database to be more precise) is updated and ready to proceed. In conclusion, and as you understand it now, CRUD is not just about some standard functions implemented in database and applications. It has far greater possibilities you should give to your admin interface and your team. The next article of this series will explain more in details how to full benefits from filters, search, segmented views and data export features. Don’t hesitate to leave a comment below if you like this article or if you want more details on our solution ✌️ But above all, give Forest a try and install your future admin interface in your company!